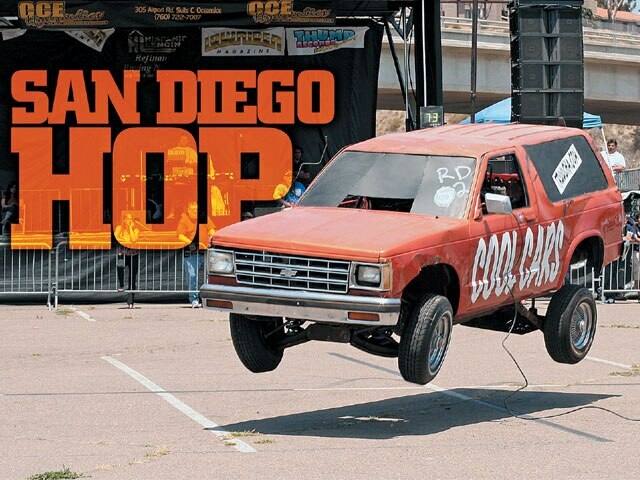 The southern tip of California was alive with some afternoon hopping and twisting action when the Hop and Car Dance competition went down at the San Diego Tour event. Old and young alike competed to continue to stack points for the Super Show shoot-out in Las Vegas on October 7. The inspection area was a place where fellow competitors hung and got a chance to catch up with one another to maybe get some insight on what might help them get the edge. For a couple of people, this would have been the time to find out that they had a problem, but sometimes it doesn’t work out that way as there were a couple of disqualifications in San Diego. With only two cars in the Single-Pump Hop, it was quick and to the point with David Marquez’ car pumping it up to 68 inches for First Place and Joe Casillas taking Second with 38 inches in his pretty mint green ’81 Chevy Monte Carlo. The Double-Pump Hop upped the count by one and not only did David Marquez came out on top once again but he also tied the Tour record of 76 inches and broke a switch in the process. John Valdez and his ’64 Chevy Impala fell short by 7 inches. 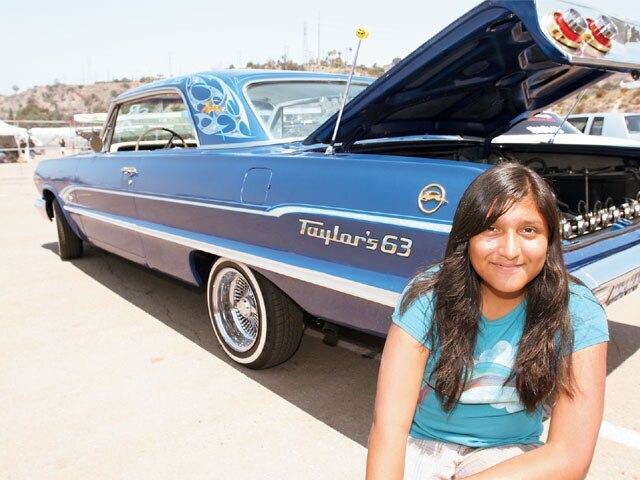 Jose Serrano and his 12-year-old daughter Taylor drove their ’64 Impala down from Lake Perris, California, pulled out a couple of batteries and Taylor took to the switch and a Third Place finish. Lone truck hopper Eppie Martinez got the benefit of a DQ and pushed himself in the rankings. The Radical Hop saw six competitors battle it out and when the smoke, “DQs” and fence banging had cleared, Greg Brown and his ’86 Olds Cutlass was king with 80 inches under his front wheels. Second Place went to Tony Longoria and his ’81 Chevy Malibu at 71 inches while Lloyd Williams hit 69 inches for Third in his ’84 Chevy S-10. Moving on to the dancing categories, there were a couple of highlights and a lot of moving around due to the uneven field. A pair of Olds Cutlasses, a Buick Regal and a lone Nissan B2200 truck made up the Street Dance category. Alejandro Fregoso placed Third with his ’83 Cutlass, Andres Canedo came in Second with his violet-colored Regal, and First Place went to Juan Chavoya as his ’84 Cutlass bounced and twisted its way one step closer to Vegas. The Radical Dance kept it moving in more ways than one with Isaac Mares pulling out a Third Place finish, and Jack Duran and his ’85 Chevy Blazer hopping and bopping into Second. Joe Casillas’ white ’84 Cutlass got some serious air and hit all of the moves to buck its way to First Place. Nicknamed “Twister,” the car did just that in making it all look easy for the ShowTime Hydraulics-equipped Cutlass. The Lowrider Tour continues to roll on and we’re looking forward to some hot action at the upcoming shows, especially as we get closer to the Super Show showdown in Vegas. Stay tuned, we hear there’s some stuff in the works, so it’s going to be a wild ride. Lined up and ready for battle. “Taylor’s ’63” is aptly named and Taylor is one switch-hitting young lady. Marco didn’t place but made a good showing. 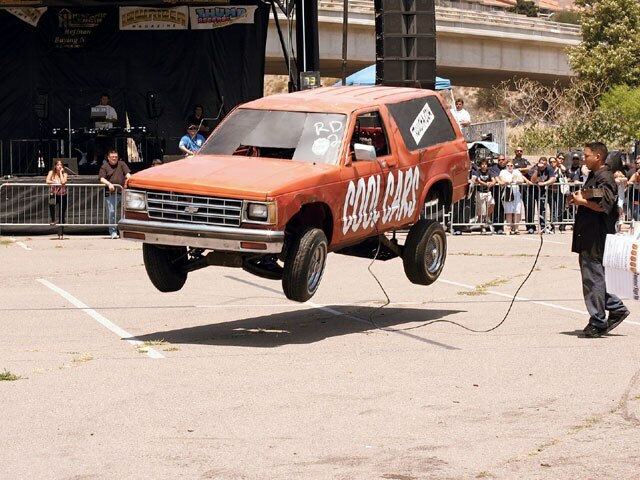 Representing CCE Hydraulics was Jack Duran and his S-10. Joe Casillas was all over the place and good for First in the Radical hop.